The Mask Monger brings us a spicy and sometimes humorous blend of mask relevant subjects directed toward both the traveled collector of Latin American ethnic art as well as those interested in Mexican culture. 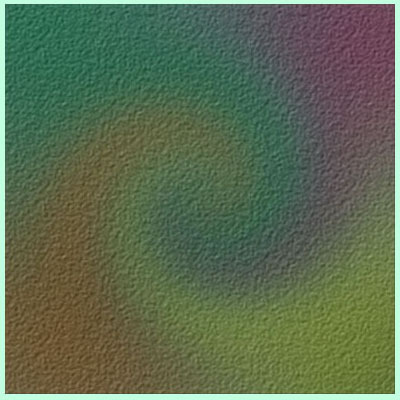 This is a non-commercial web site. 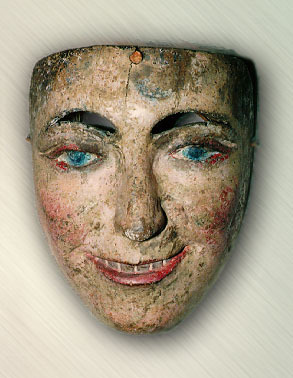 Fine old masks such as this are highly valued by collectors and museums. 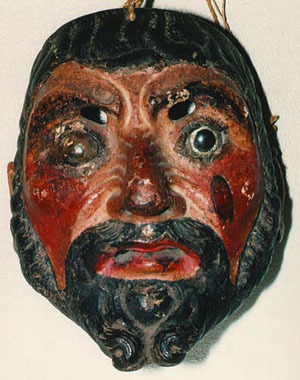 Carved in semi-hardwood with glass eyes (one broken), it has miscellaneous repairs and most of its original finish is intact. The mask has been well used and its back (link below) has a rich, dark patina more common to old Guatemalan masks than Mexican ones. The fit is extremely comfortable for a variety of facial shapes. To a collector, the back of a mask is sometimes more important than the front. An authentic, old patina on the back is a testimony to the mask's use in its rightful context. The piece at the left is authentic but with many masks commonly encountered in the marketplace and through dealers, clever techniques have been used by artisan-carvers to create a false patina intended to make the mask seem older or more valuable than it really is. False wear marks, deliberate abuse and subsequent repairs are also used in this crafty craft. Discussion regarding patinas, mask backs and fakery. Discussion regarding authenticity and collections, click here. This Vaderesque mask from Oaxaca is a "Negrito Colmilludo" (tusked little black one). The Baile de los Negritos Colmilludos is unique to the "Villa Alta" sierra near the historic pueblo of Yalalag and the dance is well documented in paintings dating from the 19th century. Negritos Colmilludos are produced in different styles but most have vertical rectangular cuts in a protruding and sharply truncated mouth with a tiny curved snout above. Javelin teeth are preferred for the tusks, (as shown in photo,) but in their absence wood and leather are used. The eyebrows often have thin, painted striations and the artistic design is refreshingly absent of Spanish-European influence. The locals of Yalalag are proud of their Zapotec ancestry. In this mountainous village of 2,000, the complex and unusual Zapotec dialect is still preferred to spoken Spanish, reflecting their independent mindset as a people. If you ever want to see Yalalag, it takes six uncomfortable hours on a bumpy dirt road to get there from Oaxaca city and don't count on the usual gas stations, restaurants or bathrooms. You will, however, find conveniently located "pulque stands" along the road. Pulque is an ancient beverage made from the fermented maguey plant and belting down a few shots helps the uncomfortable traveler overlook any inconveniences. Striking similarity of this mask to a very familiar face. Click to see another old Negrito Colmilludo. Count to fifty in Zapotec? Click to hear authentic sample of Zapotec language. Note: many sounds in the Zapotec dialect can't be captured phonetically with our Roman alphabet. 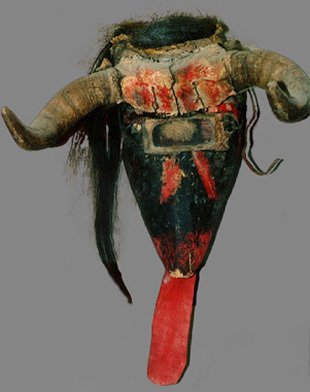 Purchased at a ranchito outside Zacatecas in the late 80's, this Pastorela Devil is particularly charming in its naive and unpretentious composition, utilizing a single glass visor eye opening, animal horns, a cloth tongue and horse hair headdress. 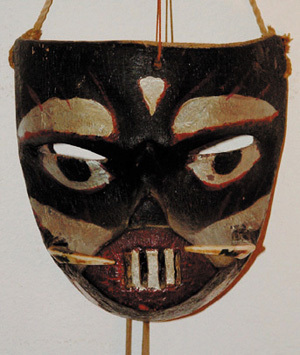 One can easily recognize that this mask was, without question, produced in its rightful context for use in the local dances. Its sale was never contemplated by its owner, which can be seen as a desirable and important quality. 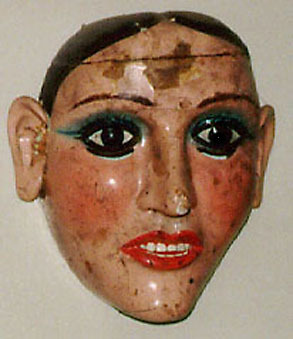 La Borracha is characterized by an oversized, garish mask with heavy lipstick, eye makeup, rouged cheeks and wig (not shown). Some might think of her as a tart. The complex El Torito dance has an unusual cast of colorful characters including hunchback, hermit and "El Torito" a body mask of a bull worn over the back of a small person. Very old, beautifully carved and delicately painted. The back is nice also, heavily worn and comfortable. The facial expression is angelic and serene. It's difficult to tell if the mask represents a man or a woman - although it is likely a catrín, a dandy. I can't say much else about this piece except that it's one of the favorites of my collection. Age: over 60 years old. The over-performed "Baile de los Viejitos" (Dance of the Llittle Old Men) is a seemingly playful festivity staged by both adults and children, particularly in the state of Michoacan. In spite of a happy ending, the tiring fandango has no real utility other than to mock a bevy of little old men, all dancing - or better to say hobbling - with feeble knees and canes while simultaneously making lecherous fools of themselves. I'm not a whistleblower but I can't understand why the elderly and the handicapped - true victims of this cruel pageant - have not uttered a single word of protest up to now; perhaps they're just too intimidated by the dance's widespread popularity to complain; thus the Baile de los Viejitos continues in its long-standing tradition as a cute and endearing icon of Mexican culture. A strange viejito experience in Oaxaca. Master craftsmen of the state of Tlaxcala create some of Mexico's finest carved wooden lacquer work in these realistic masks which are used in several different dances. The most common are the Baile de los Catrines (Dance of the Dandies) and also the Baile de los Paragueros (Dance of the Umbrella Salesmen.) An extremely smooth, reflective finish is facilitated by use of a gesso undercoat applied to the wood, making fine sanding and shaping easier for the carver. A distinguishing feature of the mask shown at left are the "operable eyelids" which open and close by pulling a string at the chin. This is accomplished by a clever spring mechanism (click here) probably borrowed from European doll making techniques. The eyes are glass and the eyelids have lashes. This lovely lady is the female counterpart of the above mask. Tlaxcala has some renown in Mexican history. During the conquest of Mexico by Cortez in the early 1500's, Tlaxcalan tribes, unfriendly with the Aztecs, abetted the Spanish in their invasion of the valley of Mexico and thus contributed significantly to the ultimate defeat of the Aztec empire. Deeply rooted resentment and alienation are said to be felt by some Mexicans to this day - but I say to anyone who still feels miffed by the Tlaxcalan's infamous deed - just let bygones be bygones. After all, anyone can make a blooper, right? Discussion of the conquest of Mexico which contrasts both the Spanish & Aztec points of view. 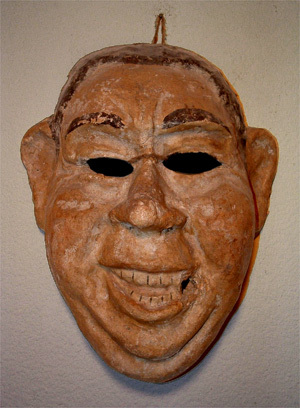 This papier mache mask was purchased from a mascarero (mask maker) in Guanajuato. Some people think that the face is that of a Mexican movie actor or politician. I personally think it looks like Richard Nixon during a smiling moment. Well, maybe not quite, but I think there is a slight resemblance in the expression. The Guanajuato maskmaker had his original mask molds which were carved out of wood, serving as a form for the layers of paper. Carnival masks are frequently made from molds, using either papier mache, plastic or cloth. 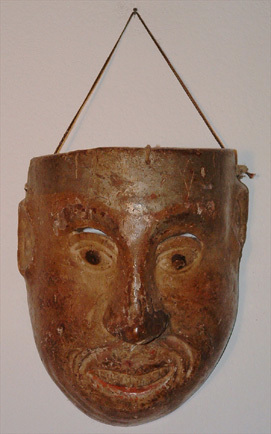 Because of their low cost, many consider them to be throwaway masks; and for this reason, it is unusual to find a nice old one like this because they are usually broken and discarded within a few years. 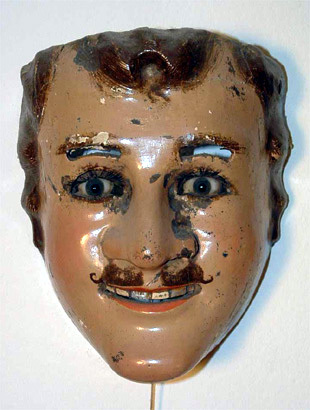 When the proprietor of this mask ordered it from the carver, he said, "by the way, super size that for me, please." This formidable piece is big - I mean really big. 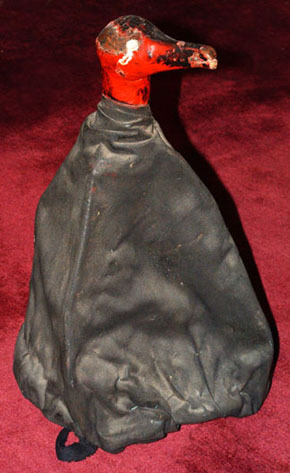 The ears are made from black rubber inner tubes and the upper half of the long snout articulates via a cord attached to the top. This mask demonstrates the relaxed artistic whimsy which I feel distinguishes Mexican ethnic art in Latin America. 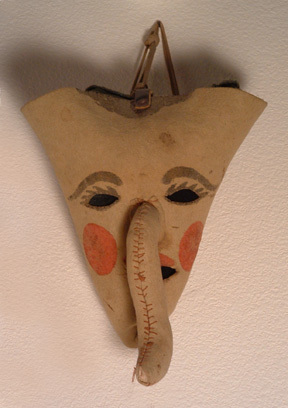 I do not find this quality of whimsy in Guatemalan masks, for example, but many would argue the point. Although Guatemala is a major player in finely carved Latin American masks, I personally find their masks to be more predictable, stylistically uniform and restrained than their Mexican counterparts. For a further discussion of Guatemala, click here - if you dare. 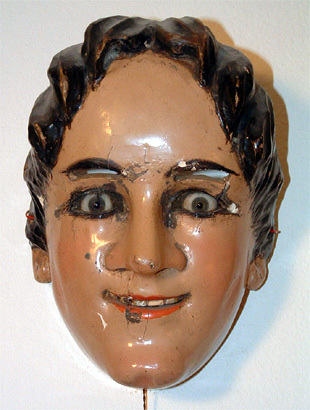 This enigmatic mask is what I call a "bedroom piece." While searching for high quality masks in the Mexico City area, visiting the home gallery of an ethnic art dealer and his wife, the bedroom piece is the one he doesn't really want to sell to you. A clever one he is, so he keeps it in his bedroom thinking you won't find it. But aha, you do find it - on the way to the bathroom - and catching him off guard, you joke him about "hiding" it from you - and you can then buy it for a noble price. A true mask monger will do anything to get a piece he really wants - and this mask, even with its ambiguous past, is to kill for. The patina is extraordinary and the original finish is intact. The distinctive carving and a deliberately naive expression add to its charm. As the thin young man and I stood outside his house on the narrow street of Naolinco, I couldn't help but notice that his pants were several inches too short. He handed me the mask and I felt its lightness in weight - sometimes a negative characteristic - but this wood was tight grained and of good quality. Most devils and demons one encounters are usually much newer - and made primarily for the purpose of sale. So it was a pleasant surprise to find a nice old monkey demon which had been well used in its rightful context. I asked how much he wanted for it and was a little taken back by his price, which amounted to about three month's pay for the lad. But he went on to explain that the mask had sentimental value, having belonged to a now deceased uncle who used to dance in the local festivities. So after a brief chat we finalized the transaction - and in fond reverence for the uncle, he stood firm by his price. Other "My Dead Uncle Masks"
The hunchback and hermit are important characters in the Dance of the Little Bull. 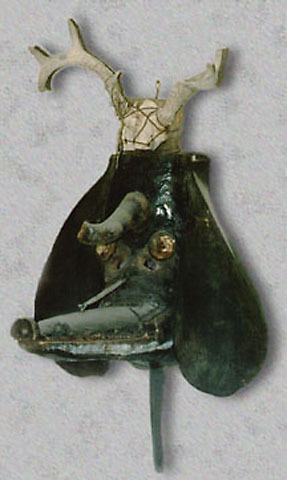 Distinct from the La Borracha (painted wood) mask shown above, this piece is resourcefully fashioned from a piece of hatters felt, riveted with leather straps and a stuffed and carefully stitched undulating snout. 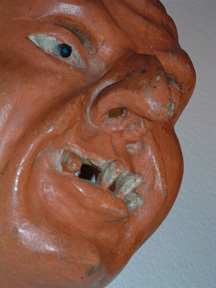 The well worn mask also captures, in its simplicity, a fine example of Mexican whimsical art. El Baile del Torito is of a humorous nature in its mockery of past Spanish corruption and decadence. I believe the dance is most common in the state of Guanajuato in cities such as Silao, but it may possibly be performed elsewhere. This mask was purchased in the early 80's from a family of Torito dancers in Silao, Guanajuato. Their colorful masks were mostly made of papier mache and included a La Borracha mask (not shown) with a large wig which was suitably garish and cheap. 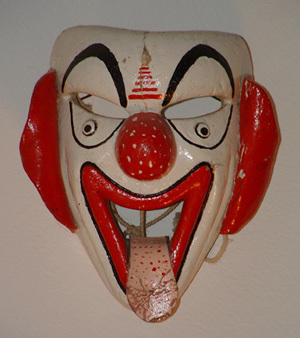 This payaso from Naolinco is of a 19th century European "auguste" style, but jesters and clowns have existed in the pre-Hispanic Americas and most parts of the world since ancient times. With enhanced freedoms of expression and relative immunity from reprisals, the clown can be a de facto spokesperson for the collective conscience, using parody and acerbic humor to ridicule authority or even shame the benefactors they serve. Their function is thus more profound than merely causing us to laugh. 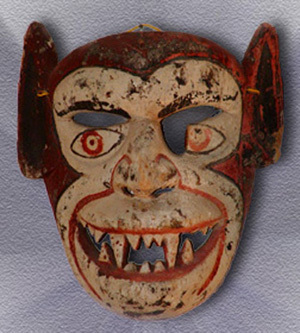 This mask is carved from a dense wood and has a leather tongue and folded leather ears. I particularly enjoy the carver's simple detail work as used in the eyes, which are carved in relief and protrude like buttons. Ah yes, this piece... Well, you see, it's just a regular buzzard hat. Huh? What the heck is a buzzard hat, you say? The answer is.... nobody seems to know. Another collector friend of mine also had some buzzard hats and he didn't know either. Use of this site for academic research is not recommended, and is done at your own peril. Please click here to E-mail the Maskmonger.